Sometimes when I close my eyes, I can still taste a salad we served at our restaurant in Mexico. It was my favorite. Ripe slices of big tomatoes surrounding a mound of creamy strings of Oaxacan cheese dressed with a tangy but sweet basil vinaigrette. One of our signature dishes–a Mexican Caprese salad–was often what I had for on a hot summer night. It was that good. I mean, you could put this basil vinaigrette on almost anything and it would be edible. In the years since we returned to San Antonio, I have been challenged to find the perfect basil dressing recipe. The one that transports me back to Zihua. I have tried several times, but never quite got it. Fortunately, with all of the rain we have had in San Antonio, my herb garden is going crazy and there has been plenty of basil, which is what inspired me to try again to make basil vinaigrette. 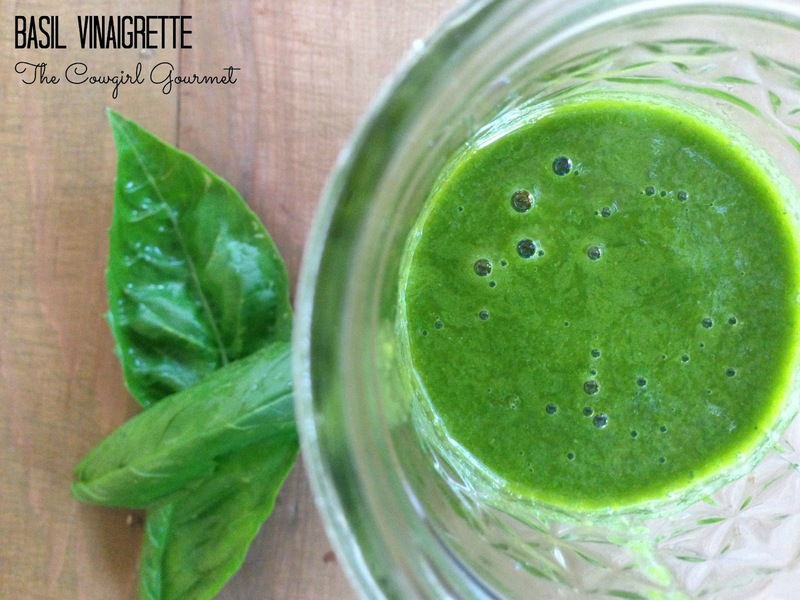 Obviously, the gods were shining on me the other day when I whipped up this basil vinaigrette. It looked right, I thought. The color was spot on. And the texture, too. It was completely emulsified, unlike others I have made. So, just before I opened the blender lid, I closed my eyes and, in one whiff, I swore I was in Zihuatanejo, where it seems like summer all year and the basil is absolutely stunning. Then I tasted it and I was immediately transported back to Mexico. If you also have a prolific basil plant, the best way I can think of to save your basil plant from some of its heavy branches and lighten its load a bit, is to whip up this sweet, zesty and flavorful basil vinaigrette. It pairs wonderfully with ripe tomatoes and mozzarella, but can also be used to dress mixed green salads, drizzled on top of grilled chicken or fish or roasted ratatouille. My vote is that you make a Caprese salad with juicy, heirloom or homegrown tomatoes, soft and fresh mozzarella (or stringy-Oaxaca) cheese topped with this incredible basil vinaigrette–and I bet you just might think you’re in Zihuatanejo, too. The trick to this dressing is fresh, gorgeous basil leaves--preferably from your (or a friend's) garden. Be generous with the basil and use a heaping cup. The combination of champagne vinegar and lemon is also key in that is provides a citrus-acidic balance that pairs perfectly with the sweet basil. Spoon generously over caprese salad (mozzarella and tomatoes) or do as we do in Mexico and serve with ripe tomato slices surrounding a mound of shredded Oaxacan cheese and drizzle the tomatoes liberally with basil vinaigrette. Place everything but the olive oil in a food processor or blender. Pulse a few times to combine, using a spatula to scrape the sides and push everything together. In a blender, remove the cap on the lid. Slowly begin to drizzle the oil in the machine. If using a food processor, slowly pour the oil in while the machine is running. If using a blender, hold your hand over the lid as it will splatter if you don't. When oil is incorporated and the basil and shallot are pureed, turn off and scrape the sides again. Cover and blend or puree for 1-2 more minutes. Place in a glass jar, cover and store in the refrigerator for up to two weeks. When using the leftover dressing, let it sit at room temperature about five minutes before serving. Shake well and use liberally. Previous Post: « Holy Choco-Mole!